Caused by: Bipolaris sorokiniana (Sacc.) Shoemaker, Curvularia spp., Dreschlera spp. Symptoms depend on the grass species and the pathogen involved. Generally a yellowing or paling of the leaf blades may occur, accompanied with spots or lesions developing (Plate 1. Lesions may girdle the leaf and the portion above the girdle withers. The sward may thin or look drought stressed. Where is Leaf Spot found? Any area of turf, especially golf greens, tees, fairways, bowling greens, lawns, parks and sports pitches. 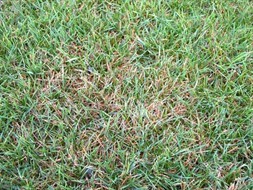 All grass species can be affected by Leaf Spots. When is Leaf Spot likely to attack turf? During the summer months, when the temperatures are high. Humid conditions encourage outbreaks. Minor infection may result in lesions on leaves but no other effects. Severe infection may thin the sward, cause dieback and leave patches with weak turf, affecting the aesthetic value and the playability of the turf. Leaf spots occur in mild and warm temperatures (around 20ºC). As the temperature increases (25 - 35ºC) blighting and melting out occurs. The removal of excess thatch and use of a higher mowing height can reduce occurrence of disease. Trials in the USA have shown that Heritage can control bipolaris sorokiniana, Curvularia spp. and Dreschleraspp.